What is the future of the world around us? What challenges do we face to address conflict, improve healthcare, build sustainable cities, and have access to clean water and sanitation? How will we know that we are having an impact in tackling these challenges? 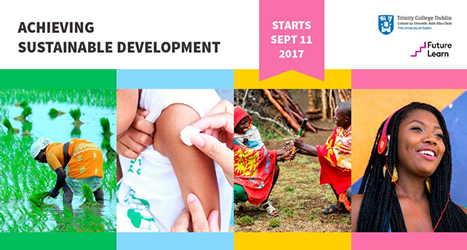 The Trinity International Development Initiative (TIDI), at Trinity College Dublin, presents a new free online course (MOOC) "Achieving Sustainable Development". Launching on 11 September 2017, and running for four weeks. Read more about the course and register here. "Explore the challenges in achieving five of the global United Nations Sustainable Development Goals: Peace, Justice and Strong Institutions; Good Health and Well-Being; Clean Water and Sanitation; Sustainable Cities and Communities; and Gender Equality. Through case studies from Ireland, Colombia, India, Uganda and Korea, you will work through possible solutions to achieving sustainable development in our world. Find out how FARC rebels in Colombia are being reintegrated into society; why urban areas are changing how we think about sanitation; why the rapid growth of cities is changing how we think about urban mobility; and how tackling HIV is closely related to food security. Critically examine the ways in which development really can be sustainable, its impact on communities, and how it can make a difference to real lives. This course is for anyone interested in the future of our world and how we can improve it. Register today through the Futurelearn platform and we look forward to joining you on 11 September to learn how together we can achieve sustainable development."